Years ago when “it bags” were in their prime, Anya Hindmarch made waves with her cotton “I’m Not a Plastic Bag” tote. In the years since, Hindmarch continued to turn out solid bags, but it was recently that she began to make waves again with quirky bags and leather stickers. I’m certain there will be much more from Anya Hindmarch on our site in the near future, but right now, my attention is on one design in particular. 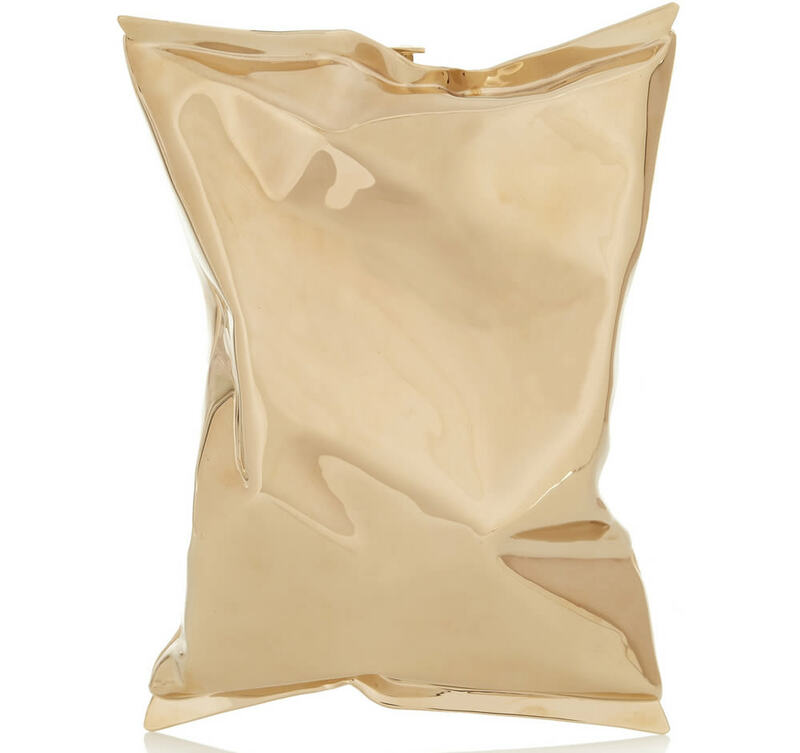 This isn’t the first time we’ve shared the Anya Hindmarch Crisp Packet Clutch, but it is the first time this bag will get its own feature. While I own some very elegant clutches, if I am to get another clutch, I’m only interested in a unique novelty piece. Clearly, this clutch fits the bill. 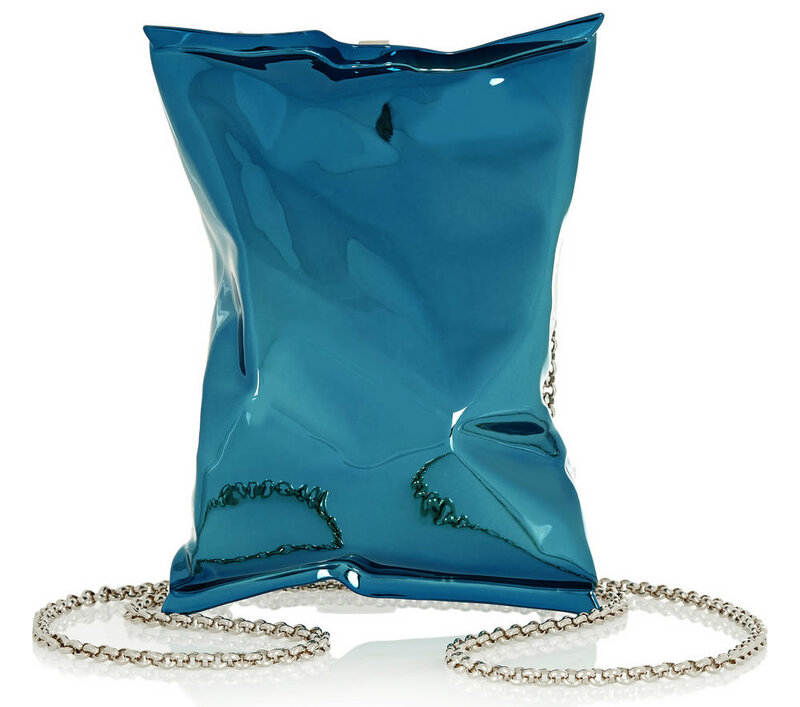 This bag was no easy feat to design; Italian artisans who specialize in jewelry helped perfect it over many months, and Anya Hindmarch intends for this to be a piece of wearable art. There are different molds, so if you bought one and I bought one, they should be different from each other. The exterior is formed with brass, I’m loving the gold-tone version best, but there’s also a pretty blue. The interior is lined in beige suede and opens with a hinge. The bag isn’t a teeny tiny clutch that won’t fit your cell phone, but it definitely isn’t going to carry many items. Dimensions are W 5″ x H 7″ x D 2″, so you can fit your iPhone 6 plus, probably a key or two, and a lipstick. I can look past the dimensions because this is clearly a novelty bag, and it’s one that I simply adore. Price is $1,595 for the blue and $1,595 for the gold via Net-A-Porter.